Russell Westbrook’s season-long one-man show of frenzied triple-double glory will finish with a stat line it deserves. With eight assists last night, Westbrook sealed his fate as the first player since Oscar Robertson to average a triple-double over the course of a season. You can mewl that the triple-double is arbitrary or that it’s only meaningful insofar as it is an interesting quirk of the stat line, rather than a legitimate achievement in its own right, or that none of this means so much for a relatively middling team such as the Thunder. That, however, would be stupid. Westbrook’s dominance has been a joy to watch, and the fact that he on his own has been able to propel this team to as many victories as he has is nothing short of amazing. 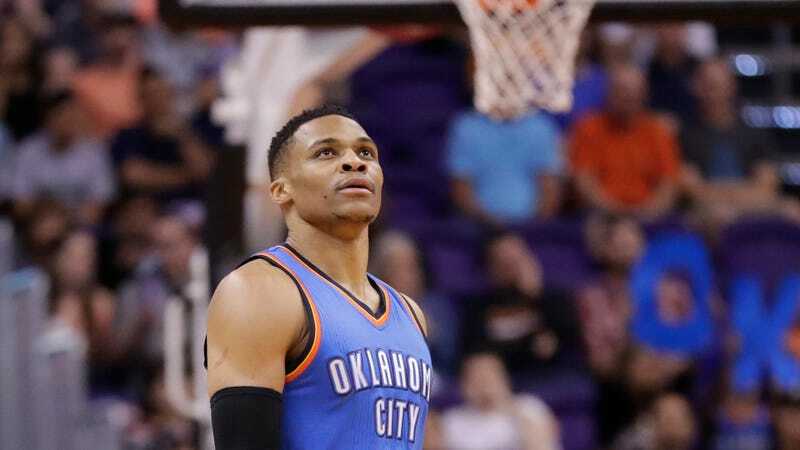 Last night wasn’t one of those—the Thunder lost to the Suns, as Westbrook came up two assists short of breaking Robertson’s record for individual triple-doubles in a season with 23 points and 12 rebounds—but it was enough to ensure that he’d finish the year with a historic stat line befitting the powerful talent he’s shown this season. Russell Westbrook is the MVP.